It might be a bit of an odd one to review as it’s not a recent book, not that any of the ones I’ve read have really been new, but I hadn’t read it so I thought I would. This is one of those books that I have wanted to read for ages and I’ve been told multiple times it’s one of those ones that everyone should read in their life so when I saw this version in the sale at the beginning of this year I bought it. I have a bit of a weakness for pretty books and I needed to replace my copy of Jungle Book which had been destroyed by water so I got one of those in this collection too. 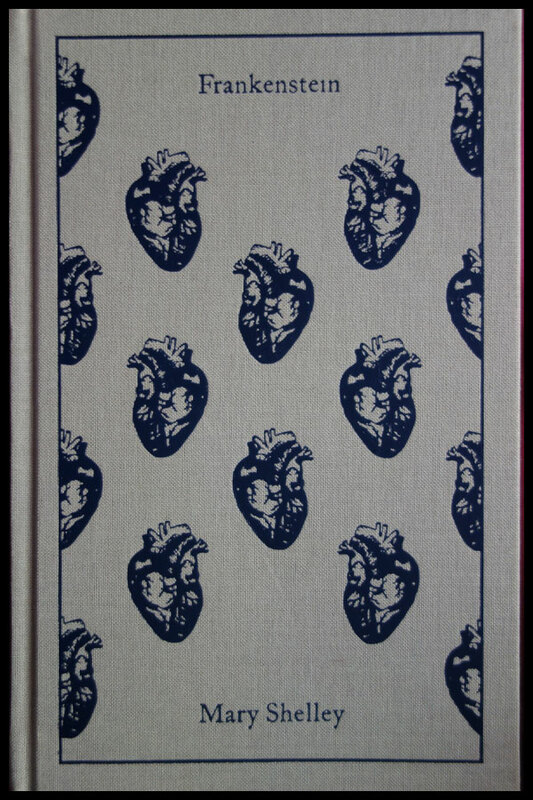 These Penguin Clothbound Classics are so gorgeous I think I’ll be collecting them. As there are so many editions of this book that have been published throughout the years and in different languages part of this book will be about the story and part of the review is also going to be about this exact edition as it has so many extras to the normal versions I’ve seen in stores. I have already said I love these covers and they’re all so nice, they have different images printed repeatedly in the same pattern with spaces for the title and author. 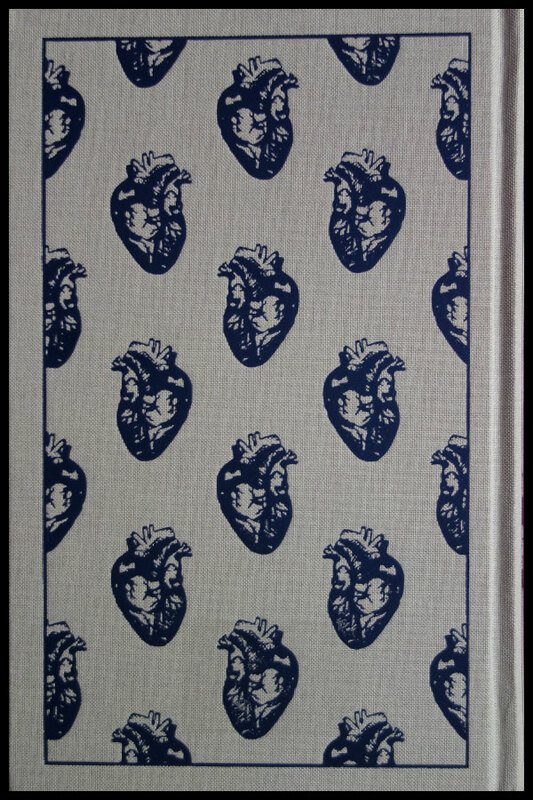 The pattern on this is in a navy and is the image of a human heart printed on a pale blue or grey base. The base is cloth, as you’d guess by the name, and the print is pressed into it which gives a nice contrast in the look as well. The cloth is fairly rough in texture which makes it feel like it’ll survive well without needing to be too protected and won’t wear out with reading, something I was a bit worried about when I first got these online. There’s nothing on the back text wise but the pattern continues all the way around including the spine. Inside is a navy blue paper lining for the front and back though in the first copy I bought the book was mounted wonky so it overlapped on the top right corner at the front and the cover didn’t cover the pages. I got it replaced but it’s worth checking if you buy it before you put it in your shelf, which you probably would anyway but thought I’d mention it. This edition includes a chronology of Mary Shelley’s life, an introduction with information on the author, the book and the science and politics of the time along with further reading on these. It also has the author’s introduction to the 1831 standard edition and the preface from the 1818 copy that I think is in most editions. There are some letters included in the first volume of the book but I’m not really sure how they tie in, they confused me a bit but maybe when my brain is more awake I might make more sense of them. The story itself is separated into three volumes with chapters in each and there are appendices and notes at the end which includes notes on things that weren’t included in different versions and the third appendix is a short story, ‘The Vampyre: A Tale’ by Dr. John William Polidori which I gave up on part way through as it’s a bit of a wall of text without obvious paragraphs and I just couldn’t concentrate on it properly. I will go back and read it again but it’s not a main part of the book so I’m not sure I’ve missed much. I do like all these extras though they do practically double the thickness of the book itself. I thought I’d take a photo to show you how much is story, the bit in the middle is the story itself and the front is the introduction which is bigger than I expected. I do like extras with these things but I haven’t really read some of them as it’s a lot to take in and it’s mainly informative. It’s probably nice background for the text but this time I was interested in the story itself and my brain has been a bit foggy so I just concentrated on the story rather than rereading those extras to make more sense of them. The story itself is one that I’ve seen many times in different versions of movies and cartoons and heard about a lot so I knew the general storyline going into it. I’m not going to comment too much on the storyline itself as I think most people know it and if you don’t then I don’t want to spoil it. I didn’t realise how much it would go into the back story of Victor Frankenstein, it took a while for the monster to be created as it started from the beginning before his creator was born. There were some things that surprised me in the book that were different to most of the movies, or the ones I remember, but in general most of them stayed pretty true to the book, though I think most of them included electricity in making the monster come to life. As I said the story itself took a bit to get going, there was a lot of information in the backstory, some of it seemed a bit irrelevant to start with but things like his sister did become more relevant later in the story. I guess the fact this is something I find with a lot of books probably shows I’m more into books that get going faster so it’s personal preference. The language used also made it appear slower to me, it’s obvious that it’s an older book and some of the sentences were a lot more complex than I’m used to which made it a slower read. I did like the descriptions and the unusual words that you don’t get so much in the modern books and it did add to the atmosphere in a way as it somehow makes it feel more gothic and spooky. It was pretty graphic in parts, especially when describing the monster and one of his dreams, which may be enough to put people off if you’re squeamish. There were a couple of times where I had to go back and reread bits because I didn’t realise something had happened, when the monster left for example, though I’m putting it down to not being used to reading older books and still adjusting to the language alongside a bit of brain fog rather than any fault of the author’s. Before reading it I didn’t realise that some of it was in the monster’s point of view, or at least him telling Frankenstein about it and the fact that he was so articulate also went against everything I’ve really seen of him, or the stereotype version used in a lot of references. I did like this bit though, it made it so you could actually see things from another person’s point of view as Frankenstein’s was pretty single minded with his obsession though as it’s looking back on the events there is some reflection on it which made it more well-rounded than it would have been if it was written in the present rather than the past. In the end I do see how this is a classic and how it influenced a lot of horror, especially the gothic aspects, and it’s more psychological horror than the full on gore that I expected. There were graphic descriptions and the language was not what you’d get in a lot of books written now but it’s still relatively modern and I don’t think there were many words that needed to be translated into modern English or described at the back. Overall this is definitely a book I am glad I own, I will be reading it again as I did enjoy the story and think I’ll enjoy it more after the first read through. I think this is probably not the best book to have read when I’m not feeling that good as brain fog kicked in a few times and I think when I’m feeling better I’ll definitely enjoy it even more. I would definitely recommend this book if you like gothic horror though you’ve probably already read it if you do. If you liked any movie version of it I’d say this is worth a read, it’s more in depth than the ones I’ve seen and there are some bits which are different than I remember in movies. It has made me want to re-watch at least one and I’m definitely looking for the Hammer version to watch somehow. There are so many versions and copies around that you could get it from a library quite easily I’d think and it’s probably available in a lot of second hand book shops for cheap if you wanted to own a copy if it’s a different version than this. I think the cheapest I could find this was £6-£7 at the moment on amazon. This book has been on my to-read list for some time. I hate that extra stuff they put in books. Its probably good for literature students studying such material, but not for the general public ! It’s definitely worth a read if you like these kinds of stories, I wish I’d read it sooner. I think it’s one that joins the group I read a few times as some get reread every couple of years and this one probably will too, especially around this time of year.